Happy Saraswathi pooja/Ayudha pooja to all my readers and my friends. 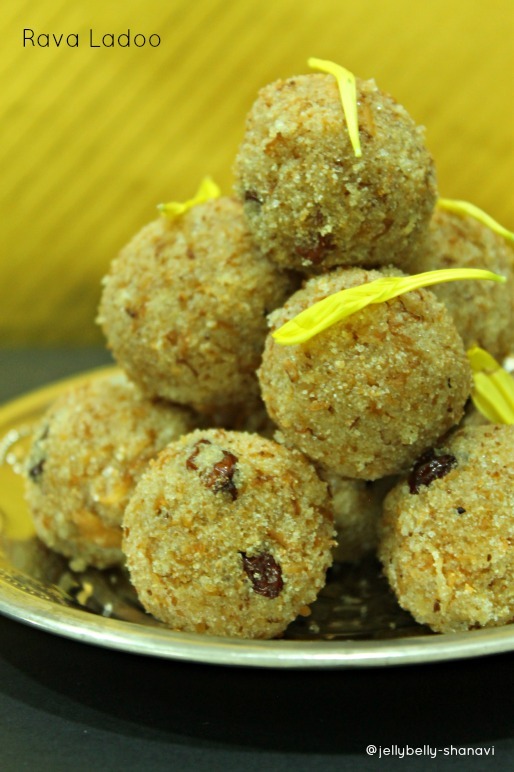 I just made a simple ladoo for neivedyam and nothing fancy. Have fun and Njoy. Add a tsp of ghee and fry the cashews till it turns golden . Add the raisins @ this stage and fry until it puffs up.Add the copra thengai (if using) and fry as well.Gather the cashews ,co[ra thengai and the raisins in a small bowl. Now in the same pan fry the coconut (if using fresh coconut) until it turns golden on medium flame. This might take upto 3 to 4 minutes.Remove the coconut to the same bowl where u've already collected nuts,raisins and coconut pieces. In the same pan roast the rava over low flame for 10 minutes ,mixing all the time,the colour would have changed from white to golden brown and have a nice aroma. Transfer the roasted rava to the same bowl filled already with the roasted ingredients and immediately dump in the sugar and all of the remaining ghee and mix well using a spatula. The sugar would start melting slightly cos of the hot roasted rava. If u may possible try to make a small ball out of it. 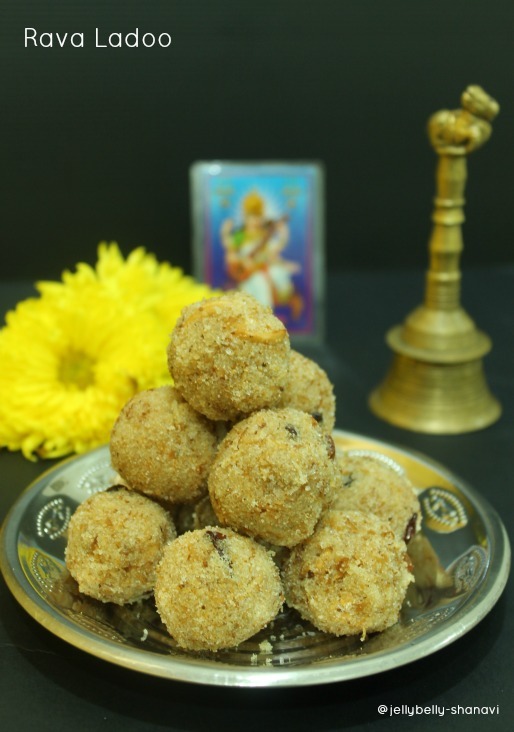 If u can't get hold of it, add a tbsp of milk and try making a ball.U may add another tbsp of milk if u want .At first, the ladoo might seem loose while making it but don panic it will turn to a firm ball after few minutes. Store the ladoo in a air tight container box. Adding fresh coconut and milk reduces the shelf life but no need to worry if u add copra thengai and skipped adding milk,it will lasts long for a week. Do not add more than 2 tbsp of milk. I plan to make it too very soon. looks awesome and you are tempting me to make it asap. I have made several time and never fails...Its a versatile recipe.. Tempting clicks too..
Yummy laddoos!! Happy navaratri to u & your family!! 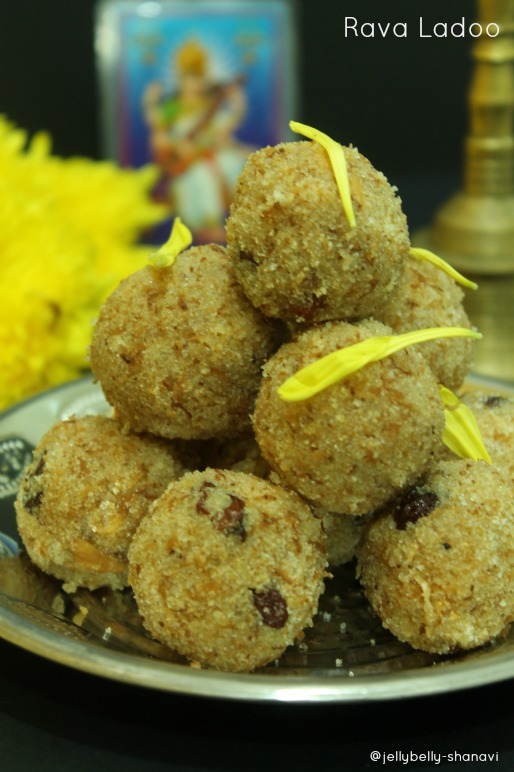 Happy Saraswathi Pooja dear, cute looking delicious laddoos. சூப்பராக இருக்கு சோ...கலக்குறிங்க..அப்படியே இங்கேயும் கொஞ்சம் அனுப்பி வையுங்க..
Love them! vellam puttu is something I love..and also the ladoos! !